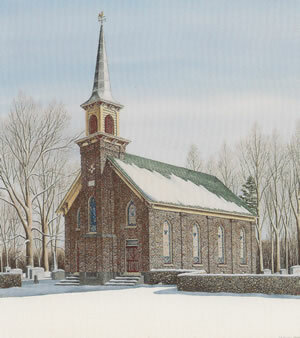 In a special release to help raise funds for its restoration, Dempsey Essick has portrayed the Fulton Church rising from an unbroken field of pure white snow, its slender spire pointing to the heavens and every detail, from the handmade brickwork to its classic, lancet arched windows and belfry, all defined in minute detail. The Fulton Methodist Church has been a landmark on route 108, two miles northeast of the Fork Community in Davie County, North Carolina since 1888. Bricks used in the building were made on the site by employees of the Hanes family, who also donated the land. After the new church was built on the same site in 1969, the old building fell into disrepair and was in danger of being lost forever until concerned friends started a restoration project to return the distinctive old structure, which is on the National Register of Historic Sites, to its original stately beauty. In "Winter Afternoon at Fulton", Dempsey has captured all the dignity and elegance of an early country church whose bell will ring out a call to worship into another century.